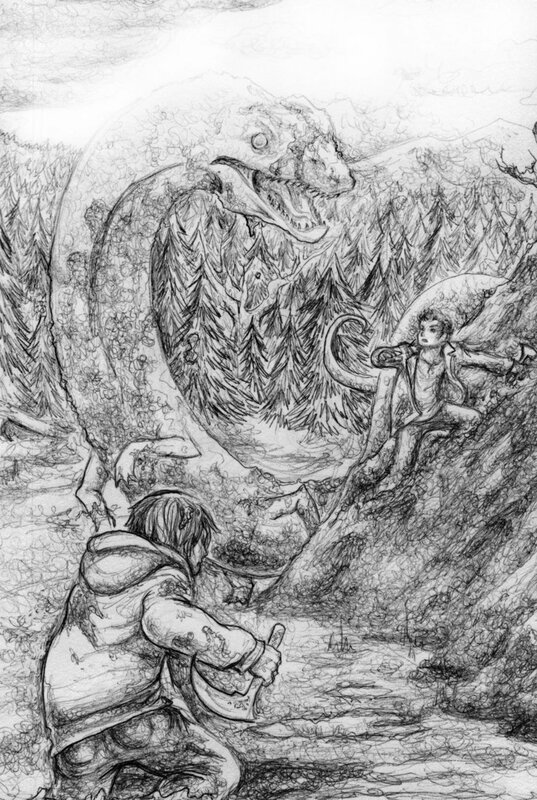 Another Bear Lake Monster story appears in the form of an original tale written by Tiffany Petitt. The story is in script format and is based on the characters of the TV show Supernatural. Tiffany, a talented artist, also created the illustration below in ballpoint pen. You can link to some of her other art here. Note: The author does not own Supernatural or any of its characters. The legend in this story is based on the actual legend, and the historical facts the author used to make the monster reality are real facts with her own twists. Published with the author’s permission. A clerk from a back road motel leaned on the dirty counter as he watched the flashing neon sign reflect off of a Chevy Impala as it pulled into the small parking lot; a nice change of scenery from the usual sun-stained van or junk car of the regular customers. Two men exited the vehicle and immediately he could tell they were related; it was something about the way they carried themselves and the similarity in the way they got out of the car. The taller one headed to the trunk while the other made his way to the small lobby. The man walked in, sporting a rustic leather jacket and holding a large milkshake in his hand, which looked somewhat unnatural with the rest of his rugged appearance. He took another sip, the straw revealing the green contents of the mint-oreo shake. “One room, two queens please” he said casually as if he’d gone through the procedure a thousand times. “You boys on a road trip?” the clerk asked nonchalantly, sliding two keys across the counter after the man had paid. “Thanks, we will” the man responded with a grin and a toast of his cup. The cool fall air flowed in through the door as he made his way back to the impala where his brother was waiting with their bags. The first thing the two brothers noticed as they entered their room was the odd contrast of the cowboy-hat patterned bedspread and the Chinese dragon painting on the wall. The wallpaper was yellow and peeling, but the beds were nicely made and the bathroom clean. Dean threw his bag to the side of his bed and plopped down, grabbing the remote and turning on the TV to America’s Funniest Home Videos. Kicking off his boots, he snuggled into the pillows and sipped more of his seemingly endless milkshake. “Well aren’t you the optimistic one” Sam mumbled as Dean laughed at a child face-planting on the TV. “Seriously though, considering the number of times we’ve died, I wouldn’t say I’m being unreasonably pessimistic” Dean continued, turning his gaze from the screen to his brother. Sam opened his mouth to speak but Dean interrupted his thought by changing the subject. Turning off the TV, Dean swung his feet over the edge of the bed and leaned forward with an expression of curious excitement. Sam flipped through the journal’s old pages and opened it up to a double-page spread, turning it to where his brother could see it. There were some doodles drawn of a dragon and some tribal symbols scattered in-between hand-drawn notes. “A what?” Dean made his “How the heck do you expect me to know what that is?” face. “You did?” Sam’s eyebrows raised in sarcastic disbelief. Sam let out a short breath of laughter and leaned back on his bed, lifting the book to read. The shaggy-haired brother looked at Dean with an expression of annoyance, then continued his explanation. Sam stood to his feet and began walking across the room, his father’s journal in hand as he continued the story, his finger pointing out particular notes he was addressing as he said them. “So this is just a cursed snake?” Dean broke in, a hint of disappointment in his voice. “A bit overkill don’t you think?” Dean cut in, raising his eyebrows. This entry was posted on Thursday, August 15th, 2013 at 7:12 pm	and tagged with deviantart, Supernatural, Tiffany Petitt, zinfer and posted in Bear Lake, Bear Lake Monster, Folklore, Idaho, Lake Serpent, Uncategorized, Utah. You can follow any responses to this entry through the RSS 2.0 feed. « It came out of nowhere…and it had the right of way.